All the flavour with none of the fuss or mess! I remember being quite impressed when my mother decided that she and I were going to start making egg rolls at home when I was quite young. I suspect the impetus was simply that she loved eating them and we were a family who rarely dined in restaurants or ordered takeout. Whatever the reason, it seemed quite an avant-garde thing to be making in the early 1970s. It was quite the production, with all the chopping, sautéing, filling, wrapping and deep frying and I remember being very messy and exhausted by the time we finally got to eat them. Nevertheless, a few times each year, we’d do it again. My mother is now almost 90 years old and still loves egg rolls, as do I. In her honour, I decided to see if I could eliminate the part of egg roll making that I like the least, which is the deep frying. My husband declared these ‘the best egg rolls he’s ever eaten’, so there’s a resounding endorsement. I like that they are healthier than their deep fried cousins and they don’t get soggy if you plan to cook them in advance and reheat before serving. I haven’t tried freezing them yet but I expect you could freeze them uncooked, then increase the cooking time when baking from frozen. If you try it, let me know! In a medium bowl, combine ground pork, soya sauce, cornstarch, pepper, ginger, allspice and garlic. Stir to blend well (or mix with your hands). Heat sesame and canola or olive oil in a large skillet over medium high heat. Add seasoned pork and cook, stirring often and breaking up clumps with the back of a spoon, until no longer pink, (about 7 – 10 minutes). While pork is cooking, bring a large pot with ½ inch (1.25 cm) of water to a boil. Place cabbage and carrots in a steamer, tossing to combine, and cook (covered) over the boiling water until just tender, about 4 – 5 minutes. Transfer cooked vegetables to a colander or sieve and press with the back of a spoon to squeeze out excess moisture and set aside. The purpose of this step is to keep the filling from getting soggy. When pork is cooked, add the cabbage and carrot to the pan, along with the chopped green onion. Stir and remove from heat. Let cool, stirring often, for about 10 – 15 minutes or until cool enough to handle. Transfer the mixture to a clean bowl and put in the freezer to speed up this step. Preheat oven to 425F. Place a wire rack on top of a baking sheet. To assemble, place one wonton wrapper on a clean work surface. Place 3 tablespoons (45 mL) of the pork filling in the centre. Working with the wrapper in a diamond shape in front of you, fold up the bottom corner over the filling. With your fingertip, brush a little of the beaten egg onto the remaining three corners. Fold the side corners into the middle. 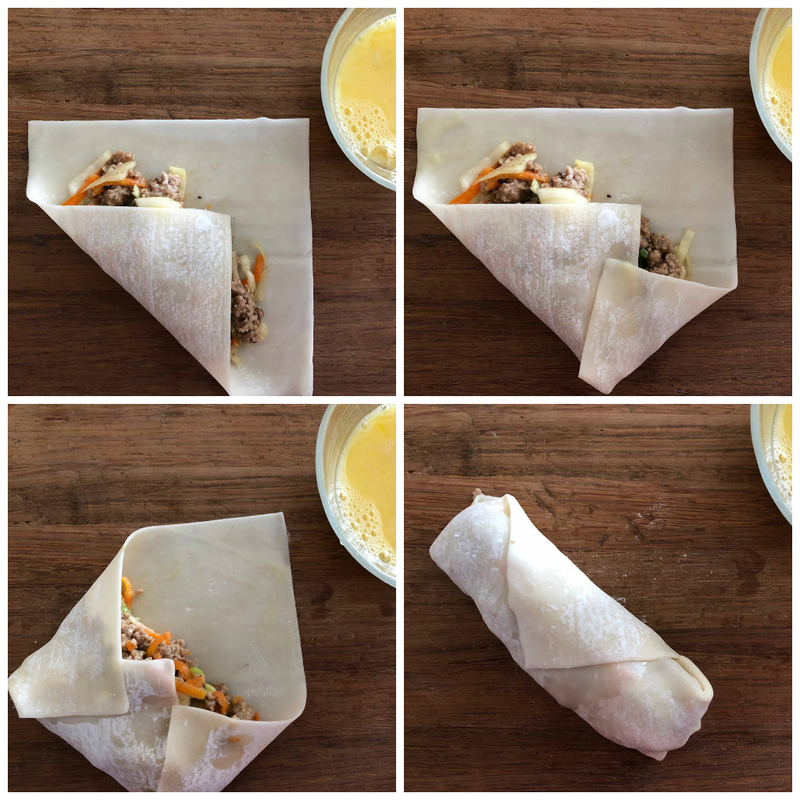 Pressing firmly on the centre of the egg roll to compress the filling, roll it up towards the top corner, pressing gently to seal. Place completed egg rolls on a clean plate. When you’ve assembled 3 or 4 rolls, brush or spray them with olive or canola oil while they are still on the plate. The objective is to coat them lightly but thoroughly. Place oiled egg rolls, seam side down, on the wire rack placed over the baking sheet, spaced about 1/2 inch (1.25 cm) apart. Finish assembling and oiling remaining egg rolls and place them on the wire rack. Bake in preheated oven for 15 minutes. 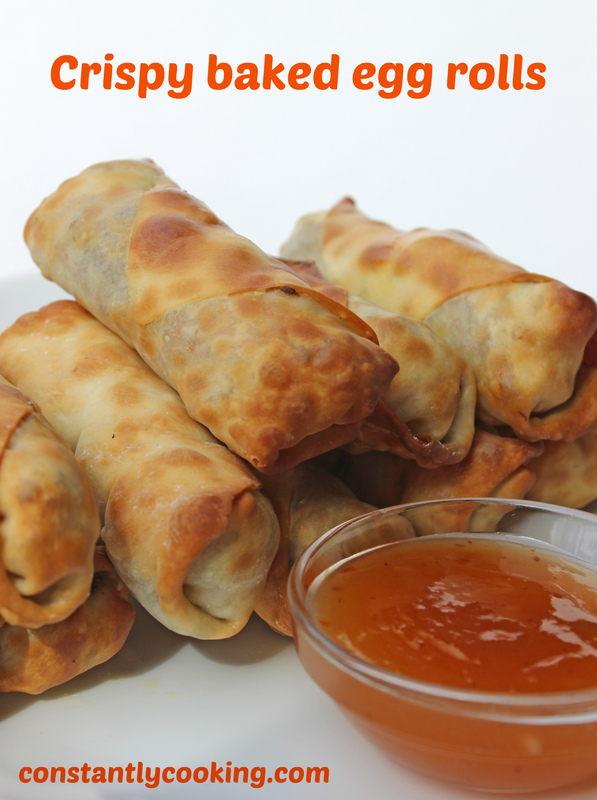 With two forks or tongs, carefully flip the egg rolls and bake for 3 -5 minutes longer, until golden brown. Let cool 5 minutes before serving, with plum sauce on the side. 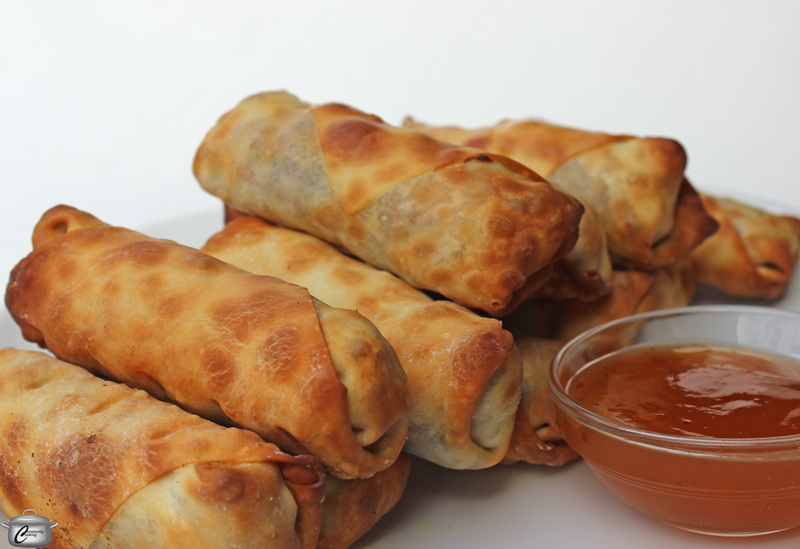 This entry was posted in Asian and tagged Asian food, baked egg rolls, can you make egg rolls without a deep fryer, egg rolls, healthier egg rolls, Paula Roy, pork, vegetables. Bookmark the permalink.